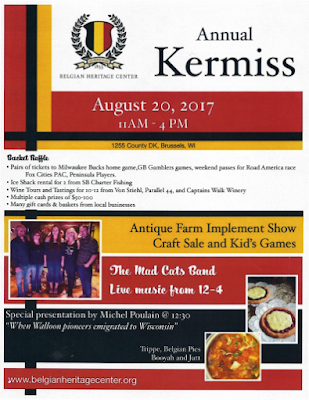 The Belgian Heritage Center is located 1255 County Road DK, Brussels, Wisconsin 54204. This event was so much fun! The food was delicious, the museum inside the church is filled with photos and stories about the tenacity of the Belgian settlers and the hardships they endured, and learning about the antique farm equipment was very interesting. story of the "Belgian Settlement in Wisconsin". one of only 42 in all of Wisconsin. This beautiful stained glass window is in the church lobby. Elizabeth was the mother of John the Baptist and the wife of Zechariah, according to the Gospel of Luke. Where the altar used to be. The Food, The Food, The Food!!! The food lines were long, but so worth the wait! It's not Belgian without Booyah!!! The Belgian Trippe (sausages) are wildly popular. Last year they ran out! and jutt (a hot sauerkraut with bacon pieces) (on the left). The Belgian Trippe was so good I had two! but I ate mine without, with mustard and onions on the side. This is my new favorite food! I now prefer trippe to brats. trippe is softer and juicier -- and just dang yummy! Click here on where to buy Belgian Trippe. Jutt -- a little too bland for me, but I was glad I tried it! The tortes. So hard to choose! I chose the peanut butter and chocolate which was beyond yummy!!! Oh, how I love old tractors!!! This machine would normally be used for tobacco plants. be put in a silo and fed to the cows during the winter. See that machine on the far right? It's a Hercules machine. original beauty and running beautifully. What a great story! The Hercules Gas Engine Co. logo, on all their equipment. Beautiful nearby barn . . . The Belgian Heritage Center is located in Namur, Wisconsin.